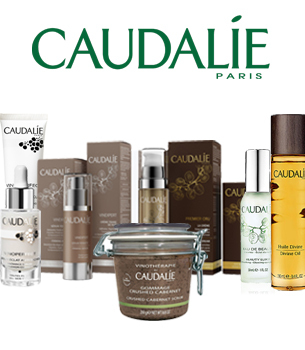 Caudalie is an anti-ageing skin care company that was founded by Mathilde and Bertrand Thomas in France in 1995. Their story begins when the duo met a University doctor who was studying the powerful effects of the grape seed as antioxidants. In particular, they discovered that the grape seed’s vine stalk lives up to 100 years. The couple patented the use of the vine stalk in their skin care’s anti-ageing products, as it works to make the skin’s cells live longer. Caudalie’s Organic Grape Water refreshes the skin naturally. The Divine Oil is chock full of grape seeds, giving the skin a concentrated boost of Vitamin E and Omega 6 nourishment. DrSkinSpa.com is an Authorized Retailer of Caudalie. All Products are Guaranteed Authentic & Fresh. 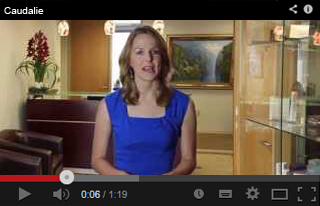 Luxury, results, and pure nature go hand in hand when it comes to Caudalie skincare products. And why not pamper yourself with lavish cosmetics and creams that do wonders for your skin without going outside of what nature has to offer? They also patented the sap of the vine, which was found to brighten the face and eradicate dark spots. Read more. The extraordinary results that have resulted from the use of Caudalie’s anti ageing products have been well documented by women the world over. Not only are the most effective ingredients used in Caudalie’s products, but the ingredients must be healthy for the skin, as is evidenced in the way the company puts their products to the test. More than 200 clinical trials are undergone before a Caudalie anti ageing skin cream is put on the market. Caudalie is environmentally green and does not test their products on animals nor use animal-based ingredients. Of course, no parabens are used. Mineral oils taken from chemicals are a no-no for Caudalie as are phthalates, sodium laureates, sulfates, or artificial dyes. This anti ageing skin team also thinks about the best packaging for its consumers. The anti ageing products are packed in tubes, not jars, lessening the use of preservatives. The natural, active ingredients in many of Caudalie’s anti ageing products include grape seed polyphenols, strong anti oxidants that can stabilize the free radicals that cause most of our wrinkles. The grape seed free radical shield also plumps the skin by preserving natural hyaluronic acids. This is the main ingredient in Caudalie’s Gentle Cleanser. Resveratrol was found in the grapevine stalks that can live for 100 years. The youth-defying Resverarol-Oleyl patented ingredient in Caudalie stimulates collagen and elastin production and plumps the skin. Omega fatty acids are replenished for extra-nourishing effects on the skin. Look for this amazing ingredient in Caudalie’s Vinexpert Firming Serum, an excellent anti ageing skin solution. Viniferine was developed from the grapevine sap and is used to diminish dark spots, producing a more radiant and youthful complexion. The patented ingredient, Viniferine, has been found to be 62 times more effective on dark spots than Vitamin C . It has also been shown to be much more effective at ridding the face of age spots than kojic acid or arbutin. Discover Vinoperfect Radiance Serum, Cell Renewal Night Cream, and the Enzymatic Peel Mask, all of which contain Viniferine. Caudalie’s Organic Grape Water refreshes the skin naturally. The Divine Oil is chock full of grape seeds, giving the skin a concentrated boost of Vitamin E and Omega 6 nourishment..